Yarn normally is singed by individual burners, one for each thread. 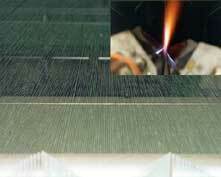 The flame shearing machine singes up to 800 threads side by side in warp form beam to beam. 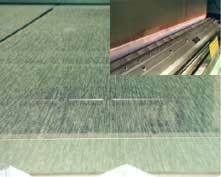 Yarn flame shearing guarantees a huge quantity of very uniform singed yarn, and is the first step in the continuous yarn mercerising process.